Constant Othenin-Girard (1825-1903) learned the craft of watchmaking as an apprentice in La Sagne. He was a partner with C. Robert in the company Girard & Robert between 1845 and 1850, after which he continued on his own as Constant Girard. In 1854 Girard married Marie Perregaux, the daughter of a well known chronometer maker. In keeping with Swiss tradition he appended his wife's family name to his own as Girard-Perregaux, and changed the name of his company to the same. At the time of his marriage Girard was working on a watch with the escapement mounted in a rotating cage, a design pioneered by Abraham Louis Breguet which he called a tourbillon or whirlwind. The purpose was to reduce deviations in timekeeping when the watch was in different vertical positions. 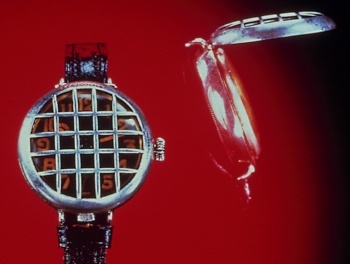 Girard's watch had three parallel gold bridges and it won a medal at the Paris Exposition of 1867. There is a story, which apparently originated with the son of Constant Girard-Perregaux, that in 1879 the German Emperor Wilhelm I visited the Berlin Trade Fair and saw some experimental wristwatches made by Girard-Perregaux. It is said that he gave an order for 1,000 of these for the German Imperial Navy, and that as many as 2,000 were eventually delivered. Because of this story Girard-Perregaux claim to be the first manufacturers of wristwatches in significant volume. It is believed that the watches were 10 or 12 lignes,A ligne, or line, is 1/12 of an old French inch, which itself is 1.0657 of an English inch. So a ligne is 2.256mm. with a small seconds hand, in gold cases to resist the corrosive effects of salt water, on wrist chains and with a grid-like metal cover over the dial. Unfortunately, nothing is known about these wristwatches apart from the story. The archives of Girard-Perregaux were partially lost some years later, there are no records of such a watch being exhibited at the Berlin Trade Fair, or being used by the German Navy, and there are no pictures of anyone in the Navy wearing one. Over the years there have been many attempts to locate one of these watches, or any other evidence for their existence, but none has been forthcoming. This is surprising if there were thousands produced and, in the absence of any evidence, most researchers now believe that the story isn't factual. The picture here was kindly provided to me by Girard-Perregaux of a watch thought to be similar to the German Navy Watch. It shows a gold watch with fixed wire lugs holding it to a leather strap. To protect the crystal there is a metal grill attached to the case with a hinge at 12 O'Clock, and a push release at 6 O'Clock to open the grill and look at the dial. However, this can't be one of the German Navy watches because it has dial with luminous paint on the hands and numbers. The first luminous paints used on watches, until the 1960s, were based on radium, which paint wasn't used on watches in 1880. Radium was only discovered in 1898 by the Curies.